What is the difference between High Pressure Sodium (HPS) and Metal Halide (MH) lamps? The difference is the spectrum emitted. HPS emits light that uses more of the orange and red side of the spectrum, perfect for plants in bloom stage. MH emits more of a blue green spectrum which is great for plants in growth stage. Can I use a 600w lamp with a 400w ballast? No. Unfortunately the wattage of the lamp must correspond to the wattage of the ballast in every case. You can’t use a lamp of higher 0R lower wattage than the ballast because the ballast is designed to drive a lamp with exactly those electrical characteristics. Are digital ballasts better than magnetic ballasts? Yes, especially if you use a lamp specifically designed for digital ballasts such as the Sunpulse Pulse Start. They give more light from the same amount of electricity, less wear on the bulb and lamps that last for two years. How long does the propagation stage last? Most plants typically require 2-3 weeks for propagation. If growing from seed, plants are ready to move on from propagation when the second set of leaves appear or when roots begin to emerge and become visible. If growing from a cutting, plants will be ready once you see new growth. What is best to help my cuttings root? We have put together a Clone Kit, which contains everything that we believe is essential for producing the healthiest cuttings or seedlings, including instructions to help you to get started. What types of growth media are available? Rockwoolis an inert medium, completely free of nutrients and usually available in a pH balanced form. Rockwool can be bought in a wide variety of forms, including cubes, shredded mixes, horizontal and vertical use slabs. Vermiculite, diahydro and perlite are all made from porous rock material, giving them excellent water retention qualities. These can be used on their own as a hydroponic growth media or mixed with soil or coco. If used alone, these products all require the use of added nutrients throughout the plant’s life cycle. Coco fibre/coir is made from the outer husk of the coconut shell. Naturally rich in potassium and sodium, most coco products are pre-treated by the manufacturers so they are ready to use. Coco is a relatively light medium that has good water retention without becoming soggy. It also has an excellent air capacity of around 30%, aiding root growth and nutrient uptake. It is strongly advised to use a coco-specific nutrient with this medium. Clay pebbles are inert, pH neutral and do not contain any nutrient value. They are suitable for hydroponic systems in which all nutrients are carefully controlled in a water solution. Clay is an ecologically sustainable and reusable growing medium thanks to its ability to be cleaned and sterilised. Soil mixes are made up of different substances to achieve certain properties. Some soils come pre-fertilised meaning less additions are needed during the growth stage, and some contain very little nutrition to give you greater control over what your plants receive. Some of the different substances mixed into soils include: sphagnum peat moss, worm manure, vermiculite, perlite, coco coir, diahydro, bone meal, beneficial microbes, lime, and bat guano. What is the difference between B’cuzz and Canna Coco? Both are quality coco and we recommend both equally. For the best results you should use the nutrient from the same brand as the medium. Hydroponics is the method of growing plants without soil - plants thrive on the nutrient solution alone. The growing medium merely acts as support for the plants and their root systems, and perhaps to hold moisture around the roots. The growing medium used, if any, is often totally inert. How often should I change the nutrient solution in my reservoir? Once a week is usually enough unless you have a small reservoir supplying a lot of mature plants, in which case you will need to change it more regularly. The balance of nutrient in the fresh solution is perfect for plant nutrition and the longer you leave it the less perfect it becomes. After a week the balance of nutrients is usually so changed that the plant’s growth may be slowed down. Flood and Drain is a timed hydroponic method, most suitable for use with clay pebbles. The root zone is flooded periodically with nutrient, allowing roots to take up whatever they need. This motion pushes out stale air, and pulls fresh air through the root zone as the nutrient drains away back into the reservoir. These systems may come as tables, where all the plants are grown together in one tray, or in a pot system with each plant in their individual pots and a large tank connecting them all together. The DWC technique relies on the plant growing towards the nutrient solution. The plant is suspended in a net pot containing a hydro medium (usually clay pebbles) to support the root zone. The roots seek moisture and grow downwards towards the nutrient solution, which is kept oxygenated at all times by an aerator. Once the roots are established and emerge from the net pot, the water level can be lowered, encouraging the roots to grow further. Drip Irrigation systems use a pump and reservoir to deliver nutrient solution through pipes and dripper stakes to many plants continuously. They are very flexible and versatile - you can create a dripper system for any growth media simply by adjusting the kind of dripper stake and schedule of feeds. A pump located in the reservoir is connected to supply pipe, which is sealed at one end, leading to plant containers. As nutrient solution is pumped into the supply pipe, the sealed end creates pressure, forcing nutrient solution out of the dripper lines and into the medium. The AutoPot is a gravity fed system, requiring no pumps and no electricity. It can be adapted for any number of plants, and is suitable for any medium that can take up water from the bottom of the pot. A mix of 50% soil/coco and 50% perlite is recommended. The smart valve means that the plant will only get a small amount of nutrient solution at a time. The tray will not be refilled until all the water has been used. This system doesn’t require electricity, is low maintenance and has no limit to the size you can have it. Nutrient Film Technique – a thin film of nutrient solution flows over the top of the tray, providing your roots with all the elements they need. The nutrient solution is contained in a tank. Above this is a gently sloping tray, which your plants sit on, and a spreader mat which gives the roots something to bed into, ensuring the nutrient spreads evenly. A pump delivers nutrient solution which spreads across as a film across the tray and roots. The solution then drains back into the tank so the process can begin again. Lack of medium gives roots excellent access to oxygen. How often do I need to change or top up my nutrient solution? We suggest refreshing your nutrient solution every 2 weeks, as things in the reservoir can change a lot in this time. The environment will also have an effect on a plants needs so bear this in mind and adjust your feeding accordingly. If you know when you are ready to harvest, you can start flushing one to two weeks before. What is the best boost for my plants? This depends on which basic nutrient you are using - generally it is best to use the same brand of booster and nutrient. Nutrients are designed differently by different manufacturers, so for example Canna use higher levels of P and K in their basic nutrients, thus only recommend using their PK 13/14 for a week compared to those who tell you to use it throughout the whole flowering period. Can I use Bud Blood/Big Bud/Overdrive with any nutrient that is not made by Advanced Nutrients? You can, but you will have to experiment with the levels needed. If that other brand recommends lots of PK boosters with the nutrient, then you can probably swap one for the other. However, you should be careful, as too much PK can interfere with the absorption of the other minerals that the plants require. If you like one brand, we often recommend that you use everything from that brand. We would recommend that you ask a member of staff for individual cases. pH is a measurement of how acid or alkaline a solution is. Measured on a scale, the lower the number, the more acidic it is and the higher the number the more alkaline it is. A plant’s roots are sensitive to the exact pH of a nutrient solution. If it varies too far from the ideal, then the root will not be able to absorb the minerals it needs to grow. Thus, keeping the pH at the correct level should help you to avoid any nutrient deficiencies and accurately monitor the plant’s health. Is it essential to check and adjust the nutrient concentration (EC or CF)? The concentration of the nutrient in the solution is also important as it tells you when the plants are growing happily and absorbing the nutrients, and when they are drinking the water faster than the nutrients. A concentration too high could damage the roots, a concentration too low could stop the roots from growing from lack of minerals. What is the ideal pH level? 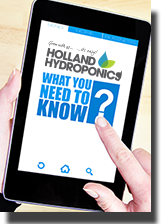 At Holland’s, we advise our customers that the ideal pH level of your nutrient solution should generally be between 5.5 - 6.5 for hydro and coco, and 5.7 - 6.8 for soil. Do your fans come wired? The Kaizen fans come wired. We do have plugs and electric cables at reasonable prices suitable for all of the fans we sell – please ask when buying a fan. How do I know if my ventilation setup is wrong? If you do not have enough air movement, your will find temperatures and humidity too high, slow growth and wilting leaves. Too much air movement will cause low temperatures, low humidity and wind burn on leaves. How do I know the right amount of air to extract from my room? There is no definite answer to this question; the air needed to be changed will depend on a number of factors. We have, however, produced a simple, general formula as a rough guide to calculating the size fan you would need based on your room size and number of lights. To calculate how much air you need to move inside your room to ensure healthy plants, you need to know the volumetric size (m³) of your room. To calculate the volume of your room: Length x Width x Height = Volume m³. For example: A room 4m in length, 3m in width and 2m high would have a volume of 4 x 3 x 2 = 24m³. To calculate how much air needed to move: We recommend that for optimal results, the air in your room should be changed at least 12 times per hour. To work out the size fan to do this, you need to calculate: Volume of your room (m³) x 12 = How many m³ per hour needed to be changed in your room. For example: 24m³ x 12 = 288m³ per hour. So, you need to select a fan that moves over 288m³ per hour. For example, you might choose an RVK A1 6”, which shifts 420m³ per hour, because the 5” RVK A1 only moves 225m³ per hour. You can check our Ventilation section to find the right fan for you based on the size of your room. PLEASE NOTE: This is a very general rule and is a basic formula using a room that has one light. For more specific conditions, see some of our suggestions below. If you use Co2 in your grow room: If you use Co2 in your room, the amount of air movement is reduced to about 8 changes per hour: Volume (m³) x 8 = How many m³ per hour needed to be changed with Co2 in your room. For example: 24m³ x 8 = 192m³ per hour. If you use more than one light in your room: For multiple lights in your room, we recommend that you move up one fan size per extra light in your room (unless you use air-cooled lighting). For example, If you use an RVK A1 6” with one light, for two lights it might be best to use an RVK L1 6”, which moves 680m³ per hour. For an extreme number of lights in your room, we would recommend increasing your fan size drastically and, if possible, take further measures to reduce the temperatures in your room, such as using air-cooled lighting, using water chillers to cool the water in your reservoir, and coating any black equipment with reflective material. This could be a number of problems. If the temperature is too high, leaves will wilt and the edges may curl upwards as well. Raise the lights away from the plant canopy or use something to cool the bulbs, like our Air Cooled Lighting range. If the leaf appears limp and lifeless, it suggests underwatering. If the leaf is firm but droops at the stem, is suggests overwatering. For both scenarios, use a soil moisture metre to check that you are giving the right amount to your plants. Lack of oxygen in the nutrient solution could also cause drooping/wilting. Water holds less oxygen when warm, so keep temperatures between 18-22°C with a water chiller/heater and use an air stone or air pumps to increase oxygen. Leaves are yellowing between the veins? This could be a sign of magnesium deficiency, most common during early flower stage. Magnesium deficiency can occur as a result of the pH being too low, when calcium is lacking or when a strong PK additive has been used. Check the pH, raise to above 6.5 in soil and 5.8 in hydroponics. If there is no change after a couple of days, Epsom salts or supplements such as the Shogun Fertilisers Calmag can be applied. Leaves turning a pale green or yellow? Nitrogen deficiencies often appear in older leaves first, and can cause your leaves to turn a pale green, or yellow. You may see stunted growth and spindly stems. To treat nitrogen deficiency, the simplest way is to increase the dosage the grow fertiliser. Start by increasing the grow feed by 1ml per litre of water until the plants leaves are started to come through lush and green again. If nitrogen levels are really low, a supplement such as House & Garden N 27% Nitrogen can be used to give a boost. Leaves smaller than usual with a blue/green tint and dark blotches appearing? This could be a sign of a phosphorous deficiency, most commonly happening due to the pH being outside the recommended zone. Lower pH to 5.5-6.2 in hydro and 5.5-6.5 in soil. Feed with base nutrients or add supplementary phosphorous. Yellowing leaves with rust blotches and burnt edges? This could be a potassium deficiency. Although plants appear vigorous and tall, branches are weak and the leaves are dull. Feed plant with base nutrients or add supplementary potassium, such as Canna Minerals K 20%. How do I control pests? Thoroughly cleanse the area before putting the plants in, make sure your intake fan has either a carbon filter attached, and air sock or a tight mesh covering the opening and ideally wear a pair of overalls to ensure any pests that may come in contact with your clothing aren’t transferred into your grow room. Finding yellow-white spots on the leaves? This could be a sign of a spider mite infestation. Check for tiny moving specks on the underside of the leaves, and fine webs between branches. Decrease temperature and raise humidity to slow their life cycle. Remove any leaves with more than 50% of damage and use pesticides, smoke bombs or predators. Silvery white specks found on the top of leaves? Damage can look similar to that of spider mites, but without the webbing. Shake the plant to find any Thrips hiding under the leaves. These are difficult to control with sprays as they are often resistant to pesticides and hide in the soil. It is recommended to use Thrips predators. Roots turning brown and slimy? Pythium (root rot) is a fungal infection that thrives in warm, oxygen-poor water and soggy soil. Prevent it by using beneficial microbes such as Viresco, change the nutrient tank weekly and be sure to sterilise all equipment at the beginning of a grow. If infected, reduce water temperature to 18-22°C, increase oxygenation and use cleaning agents such as Root Rot Stop or Pythoff.